A while back I installed some crazy open source network adapter virtualization software. Don't ask. It was a bad idea and I happily clicked Yes Yes Yes, Oh Yes, I Know, Hurt Me, Warning, Sure, Absolutely, Next, Next, Finish without a thought. Later, things started acting wonky so I uninstalled it. Unfortunately, their uninstaller didn't so much "uninstall" the program as it "uninstalled the uninstaller then left everything around chilling." This left my system in a really weird state with half-connected phantom network adapters and I was getting some weird hangs. Each time I uninstalled these 7 (!) phantom network adapters, they'd be back on a reboot. Clearing removing them with the Device Manager UI wasn't working for me. At this point it was either time for a repave of the machine (basically a complete reinstall since I got it into a bad state) or running around in the registry and deleting these phantom adapters. Since I'm supposed to be technical, and since I was ready to reinstall it wouldn't hurt if I messed up the system, I fired up regedit.exe. I ran it as Administrator so I could have (I thought) the ability to delete anything. "Access Denied." What?!? I'm the all powerful Administrator! sudo make me a sandwich! Administrator isn't all powerful. There are other, deeper users like SYSTEM that have access to things Administrator (rightfully) doesn't. Considering that I am trying to removing low level network stuff it was good that I was being stopped. That said, what's the best way to motivate an engineer? Tell him something isn't possible. I hate getting Access Denied. Deny this, I say! So I turned to the SysInternals Tools, specifically PsExec. If there was one tool that really "takes the safety off the gun," it's PsExec. You can hurt yourself and your system with PsExec in ways where you'll not realize until it's too late. There aren't enough words with big enough fonts and scary enough evocative stock photography to fully express how dangerous this tool is. That said, here's cheerfully how to use it! Woohoo! At this point, I was able to delete basically anything in the registry. One other way I could possibly delete keys that I couldn't as regular Administrator would be to launch Windows into Safe Mode and try editing from there. Other awesome things you can do with PsExec include running processes remotely (which is kind what it's doing when I run it as SYSTEM, just all on on machine.) with a Service that gets automatically installed remotely and then runs the processes. PsExec allows redirects of the input and output of a remotely started executable through the use of SMB and the hidden $ADMIN share on the remote system. With this share, PsExec uses the Windows Service control Manager API to start the PsExecsvc service on the remote system which creates a named pipe that PsExec communicates with. This named pipe is what allows for input/output redirection back to the system that launched PsExec. Which means you can run commands on that remote computer as if you were there, in a SSHy way. Powerful but really useful stuff for when you really don't feel like RDP'ing (Remote Desktop'ing) into a machine to simply run a command. Thanks, I could have totally used this the other day. /me bows before Your l337ness. Rather than reinstalling the system or messing around in the registry, you could do a system restore... I thought it was useless, until it saved my day after a nasty malware infection. Good point, Thomas, although for me, literally MONTHS passed with the issue and I didn't want to go that far back in time. Of course, if you are using a modern version of Windows you really should just use the included WinRS.exe if you want a remote shell, that's what the RS stands for after all. Or, if you are a PowerShell sort, use Enter-PSSession, both are built on top of the same WinRM infrastructure. Excellent post! PsExec is amazing, used it a lot back in my pen-testing days. So did you excise the demons from your machine? psexec sounds like it emulates the old 'net admin' command. Of course, when that disappeared, I just used at.exe for remote execution. Tricky to work with, but it did the job. All joking aside, great article. What happened to the good advice of keeping recent backups? 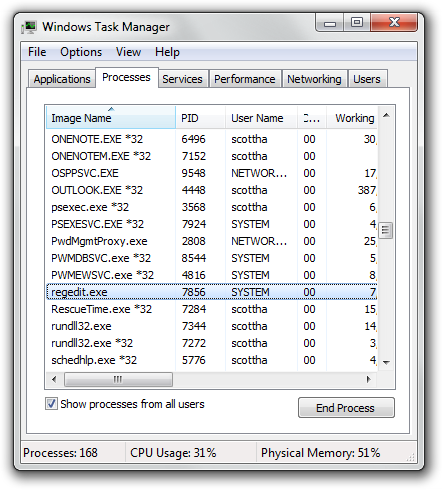 I use TrueImage which images my c: drive every day through its scheduler and I keep a rorating last x copies. Worst case is a I lose same days work. Another thing I do is before every install of a software I ask myself: is this a safe install and it won't mess up my system if something goes wrong. If not, I do an impromptu image and come back after 20 minutes when the image is done. A network adapter virtualization software seems to fit this criteria. DO NOT USE PSEXEC AS AN SSH TOOL. The above scenario has several downsides: first, if you're not already attached to a share on that computer's system, using secure authentication, YOUR USERNAME AND PASSWORD WILL BE SENT AS PLAIN TEXT ACROSS THE NETWORK WHEN CONNECTING TO $ADMIN. REPEAT: DO NOT USE PSEXEC AS AN SSH TOOL. Unless you want to get fired and put your network at risk. Your choice. Have you ever tried using uninstaller products like Revo Uninstaller Pro? I'm sure there must be others but I know Revo has a install monitor feature so it does a better job of uninstalling. Would Revo Uninstaller have taken care of this? Justin - I'm not sure, but I'd be surprised if it could. These were low-level network adapters that were simply "left over" from the previous bad installer. I'm not sure how Revo could know that. Gabe - Thanks for your comment and for our follow up emails. I'll try to do a post on better ways, and PowerShell, soon. will erase your system32 directory. which is awesome. Seems like the most straightforward way to deal with this is to Take Ownership of the relevant registry sub-tree, grant Admin permissions, and then delete the subtree.